At Temecula Preparatory School our Student Support Services Department (SSS) is built upon the belief that our rigorous academic program should be accessible to all students and our instructional practices and other educational activities need to facilitate access and success for special needs students. Student Support Services takes a holistic approach to caring for its students by considering the physical, emotional, and mental needs of all students while in the classroom, on the playground and even at home. Multi-Tiered System of Support (MTSS) is a method for systematically providing interventions that are proportional to students’ needs. 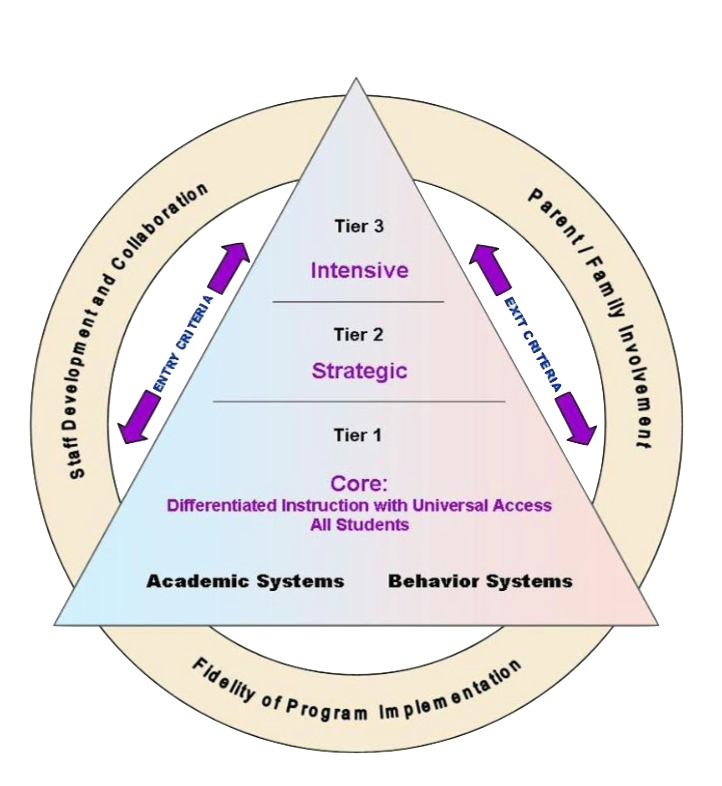 Multi-Tiered System of Supports is an integrated, comprehensive framework that focuses on core instruction, differentiated learning, student-centered learning, individualized student needs, and the alignment of systems necessary for all students’ academic, behavioral, and social success. Student Support Services will identify at-risk students, monitor student progress, and provide quality interventions. Response to Intervention (RTI) and positive behavior supports are used to assist students with behavioral and social needs. Response to Intervention is a form of the Academic Systems of the Multi-Tiered System of Support (MTSS) program at TPS. Response to Intervention is a multi-tiered problem-solving approach to ensure academic success for all students. RTI is based on providing tiers of interventions based on progress monitoring of student progress and response to provided interventions. Positive Behavior Supports is a Behavior Systems approach of the Multi-Tiered System of Support (MTSS) program at TPS. The purpose of this behavior system is to assist with establishing the social culture and individual behavioral supports needed for school to achieve both social success for all students. It is a collaborative approach amongst student, parent, teacher, staff, and administration. Interventions are designed to meet the needs of students who have been identified as needing additional support to address their behavior or social/emotional needs. To make sure we give each student the attention he or she needs we consider all new students “At Risk” for their first month at TPS. If a student has adjusted to TPS successfully they are no longer considered At Risk unless a parent or faculty member brings concerns to Student Support. If a student does struggle after their first month, they are maintained as “At Risk” and entered into the Response to Intervention (RTI) program. A student will stay in RTI until they have made the adjustment successfully or it is determined that there are greater needs that can be addressed through a Student Support Team (SST), medical plan, 504 plan, or IEP. During this process Student Support works closely with students and parents to ensure that all stakeholders are involved. Again, TPS has a very rigorous curriculum. For the majority of the students and parents this curriculum is sufficiently challenging. In grades 9-12 students can take a number of Advanced Placement (AP) courses for an additional challenge at a higher level in their education and to better prepare them for college. As the success of the school has grown it has become apparent that there is a growing population of students and parents who would enjoy additional challenges. For these students, Student Support Services is able to work with individual faculty members to create alternative and more challenging assignments for reading, writing, problem solving, and inquiry for gaining a deeper understanding of course content. As required by California law, TPS administers the California English Language Development Test (CELDT) to all new students with a home language other than English and to all English Learners annually to determine each student’s individual proficiency level and to reclassify students to Fluent English Proficient (FEP) when appropriate. Student Support also services students with ELL needs as well. ELLs benefit from instructional approaches that treat language and content in an integrated way. The instructional program at TPS is designed to help ELLs build language skills that they need to succeed in content classrooms, college and careers. Over 90% of our teachers are certified to work with English Language Learners. – Any child who is the subject of a juvenile delinquency court petition and who has been removed from his or her home by the court and placed into foster care under a “suitable placement” order. This includes youth who have been placed in a foster home, relative home, or group home. Foster youth qualify for assistance and will benefit from Multi-Tiered System of Supports (MTSS). They change schools more frequently, are placed in more restrictive education settings and have poorer quality of individualized supports than their non-foster care peers. Because foster youth may not have stable advocates at home, schools must be sensitive to their distinct needs in order to provide a quality and supportive educational experience. Student Support Services will assist in this process. Unaccompanied youth and homeless include individuals who are not living with a parent or guardian, who are residing with a caregiver who does not have legal guardianship, who are living on their own, and who lack a fixed, regular, and adequate nighttime residence. It is the primary responsibility of TPS to enroll and educate homeless children and youth. It is not our requirement to make judgments about the validity of why a student is not living with a parent or guardian but it is our duty to ensure these students have equal access to the classical curriculum at TPS. Student Support services will assist unaccompanied and homeless students in this process by working closely with the student, teachers, school staff, school administrators, and school community. Temecula Preparatory School’s special education staff is committed to providing specialized academic and behavioral support and instruction to students with exceptional needs. Student Support Services staff challenges students to be engaged in high quality learning while preparing and inspiring them to find truth, beauty, and goodness in classical education curriculum and school culture at TPS and community.